So much fun! I love this series and I love this book. 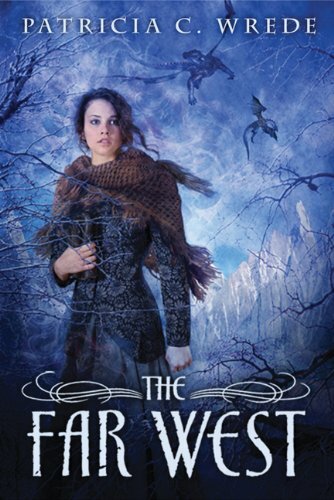 Anna already reviewed the first two books, but The Far West just came out this month and I got a copy immediately. In hardcover, even. One of the things that impresses me about this entire series is the world-building and this book continued the process magnificently, continuing to delve into both the theory of magic and the unknown wildlife of out in the unexplored far West. As you may have noticed from previous posts, I love me some world-building and Wrede does it beautifully. The series is set in the days of the settlers except that there’s magic, which has made a significant difference in history and national politics as well as ecology. There are three main theories of magic: Avrupan, Aphrikan, and Hijero-Cathayan, each with their own structure and way of manipulating magic. While these were each introduced in the prior books, The Far West looks more closely at the differences and similarities of each type as Eff, the main character, goes on an exploratory expedition further West than anyone else has gone before… or at least further West than anyone else has returned from. There’s new wildlife and new magical theories and a small group of people trying their best to figure out the world and survive the process long enough to report back. One of the many wonderful things I appreciate about the book is that there’s no bad guy. There are disagreements and personality conflicts and wild animals and danger and adventure, but it’s all situational. There’s no one out there specifically trying to do evil… it’s just a dangerous world and Eff and the rest of the expedition have to work hard to survive. They don’t all get along, they certainly don’t all agree, but they all have a common goal. The one thing that I really did not like about this book, however, was the fact of the epilog. Not that it was bad, but that it existed. Wrede did that thing where the epilog gives brief descriptions of the future lives of each of the main characters: So-and-so went on to do such-and-such, what’s-his-name went on to do this-and-that. It ended the series. This is book three of a trilogy and Wrede decided to tie it off the loose ends, at least as far as character development went. But there’s so much more out there. It’s this rich world and complex characters and no hope for another book in the series. Hmph. I will have to sulk and re-read it some more. She also manages to blend the fantasy genre and period-piece genre better than almost any author I’ve read. I won’t totally divert this review, but Sorcery & Cecilia is just such a wonderful fantasy story set in the Regency period, and is just such a perfect blend of historical romance and fantasy that it seems so easily done, but it clearly isn’t*. Anyway, the Frontier Magic series is set in an alternative universe that is obviously similar to our pioneer days in the United States, but with a world that developed with magic. The main character and narrator is a young girl who is born the thirteenth child in her family, which is considered extremely unlucky, to the point where relatives insinuate she probably should have been “taken care of” at birth. Within the first book, Thirteenth Child, she grows from about 5 years old to 18, growing up, going to school, and learning magic, and then the second book continues for the next couple of years, where she takes on her first magical job as a young adult. The third book, The Far West, sounds like it starts off where the second book ends. Both books are a bit more atmosphere-driven, and less crisis-driven, so it has a leisurely pace that can take a little adjustment as a reader of rip-roaring adventure stories. However, it is such a charming book in every way, from the magical elements to just the frontier elements—it reads a bit like a fantasy version of Little House on the Prairie. And, seriously, what could be better than that? *Aside rant: how is this so difficult? Seriously, one would think the two would go hand in hand—vampires and all sorts of other magical creatures are immortal, after all. The audience that reads fantasy books has a pretty big overlap with the audience that reads historical novels and romances, I believe. How is almost every period-piece fantasy book I’ve read just terrible?